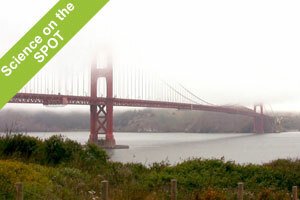 While foggy days aren’t ideal for a summertime picnics, coastal fog does benefit the ecology of the Bay Area. Normally I wouldn’t be hoping for a chilly, foggy day during the summertime here in San Francisco. For the purposes of filming our Science on the SPOT story, “Science of Fog,” however, we hoped that the Presidio would be socked in with a thick blanket of fog for our interview with UC Berkeley’s Todd Dawson. Luckily, Mother Nature cooperated with us to give us plenty of atmospheric fog to work with for our shoot. We interviewed Dawson about the two types of fog that are prevalent in the Bay Area, and about his ongoing research on the decline of fog along the California coast. Dawson also elaborated on some conflicting reports in the media on whether fog was declining or actually increasing. “There was a study done previous to ours over a shorter period of time. It’s only about 35 years. And the records came only from the Los Angeles area and from San Francisco. They weren’t a comprehensive sort of investigation of all of the temperature records that we’ve done throughout California. Our investigation is much longer. It takes place over more than 110 years. It’s hourly temperature records and precipitation records. It involves all of the fog data from the airports that we’ve been able to get throughout the entire state. And, of course, it’s a longer period. And to learn more about why foggy days – while not ideal for a summertime picnic – benefits the ecology of the Bay Area, check out the Science of Fog. QUEST on KQED Public Media.